Sorry, Jerry. Your sport makes you millions, but it also maims and cripples people. Time to do something about it. 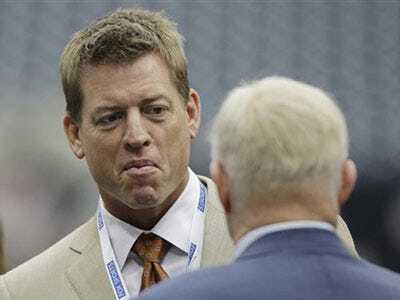 Legendary NFL quarterback Troy Aikman is so alarmed by how violent and dangerous pro football has become that he’s speaking out on the issue.According to the transcript below, Aikman recently told Bryant Gumbel, the host of HBO’s Real Sports, that if he had a 10-year old son he might not even let him play the game because of the injury risk. The NFL is quietly taking baby steps toward addressing this problem, but with stars like Aikman speaking out, the league may soon be forced to do something radical. (As it should). Aikman himself thinks the NFL should go back to leather helmets, so players are less inclined to use their heads as weapons. Aikman also thinks the idea of moving to an 18-game season to further boost NFL revenue is insane–16 games are hard enough on the players as it is. BI’s Nicholas Carlson proposes another solution to the NFL’s horrific injury problem here. And he argues that, as a result of these injuries, the NFL will look very different in 2020. Aikman: “I think that we’re at a real crossroads, as it relates to the grassroots of our sport, because if I had a 10-year-old boy, I don’t know that I’d be real inclined to encourage him to go play football, in light of what we are learning from head injury. And so what is the sport gonna look like 20 years from now? Gumbel: “With their face– with their head when you have– when their– when their grill is exposed. Gumbel: “Would play be diminished?